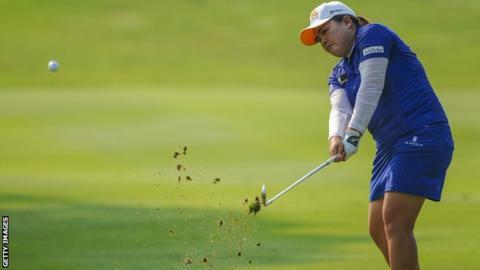 World number two Inbee Park won the Lorena Ochoa Invitational with a three shot victory in Mexico. South Korean Park led after the third round and carded a 64 - including eight birdies - in the final round to finish 18 under par. Spain's Carlota Ciganda finished second, while South Korea's Sei Young Kim was third, two shots further back. "It was almost a perfect day today. I didn't make any mistakes, so I was able to focus on my game," said Park. "It was a lot of fun today with Carlota playing so well. Winning this tournament is such an honour." World number one Lydia Ko skipped the tournament in order to rest ahead of her title defence in the season-ending CME Group Tour Championship in Naples, Florida, next week.